Asian Pear or Nashi Pear £18.00 - Pears and Quince Apple Trees and Fruit Trees For Sale. Buy at competitive prices with wholesale discounts. 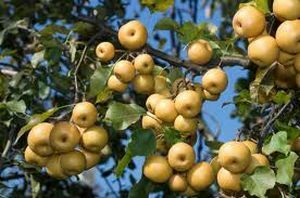 Crisp and juicy like a ripe pear, can be eaten from the tree in August and September. Self fertile and crops reliably. Makes a good freestanding tree and can also be trained well on a wall.